When the Religious Right and Jesse Jackson are in agreement, you know we are in the last days. I remember in the 70's having a higher opinion of Jesse Jackson than I have had in the past 15 to 20 years, but he has moved back up several notches in my opinion. As much as it pains me to say it, so has Ralph Nader(who also has come out in defense of Terri Schiavo). We are now seeing the honest liberals separated from those who are simply libertines (i.e., moral degenerates). On the one hand you have liberal Democrats who stand for principles that they really believe in, and on the other you have calculating self-serving liberals (such as the Clintons) with their fingers in the wind, checking to see what advantage they might be able to take from the death of this helpless woman. Sincere thanks to Jesse Jackson. I may not often agree with him, but at least he believes in something, and so we have a common basis to carry on a conversation. I was telling a Democrat friend of mine the other day that if the Democrats would stop siding with the Devil on all the moral issues, I might actually be tempted to vote for one again. Maybe this is the first step away from Beelzebub for at least a portion of the Democratic party. This weekend I fly up to Oklahoma City to visit St. Benedict Orthodox Church, and celebrate their feast day with them. This is the parish that brought me and my wife into the Church, and so it has a special place in our hearts. It is hard to imagine how I would have discovered Orthodoxy, had they not been there. When I was attending their as a regular parishioner, they were in a small store front location. Nevertheless, when I first attended I had a taste of what St. Vladimir's ambassadors to Constantinople experienced when they entered the services at the Hagia Sophia. Obviously, the building was not itself impressive, but the beauty of the services shown through, despite the humble facilities. But now the facilities are not quite so humble. They finally moved into their permanent Church a few years ago, and they are now paintint the walls with icons. It was joy to be there for their feast, and also to see how far they have come, and how much they have grown. It gives mission parishes such as my own, hope. Click here for some pictures of how the Church looked last Christmas. It now looks even better, and hopefully they will soon be posting photos of this past Sunday. Bishop Peter came to serve the hierarchical services, which was the first episcopal visit to St. Benedict's since the ground of their present Church was blessed. The wonder-working Kursk Icon was present for the faithful to venerate. I was blessed to carry this icon on a couple of occassions over the weekend, and it was a wonder to be (even for a short time) the bearer of an icon with such a history. What a wonderful weekend it was. 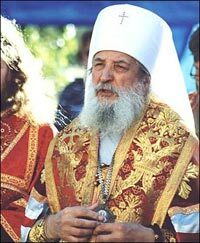 SYOSSET, NY [OCA Communications] — In a statement dated March 24, 2005, Protopresbyter Robert Kondratick, chancellor of the Orthodox Church in America, addressed the case of Mrs. Terri Schaivo. "As affirmed on numerous occasions in recent years, the Orthodox Church in America fully recognizes and proclaims the sanctity of all human life, created in the image and likeness of God," Father Kondratick said. "Life is a gift from God, one which we are expected as Orthodox Christians to revere and steward in a wise manner, fully recognizing the image of the Creator in every human being. "In light of this fundamental principle, it has also been affirmed on numerous occasions in the past that extraordinary means of prolonging life, as well as extraordinary means of ending life, are inconsistent with the wise stewardship of God's gift of life," Father Kondratick continued. "This is especially crucial in cases in which no clear consensus has been determined with regard to a person's state, as in the case of Mrs. Terri Schaivo. As such, the removal of Mrs. Schaivo from feeding tubes as a means of hastening her death can in no way be condoned or supported. Doing so constitutes a gross lack of wise stewardship of God's sacred gift of life and an extraordinary means of hastening her death by starvation. This is especially so in light of the fact that there has been no clear consensus on her level of awareness and responsiveness, that she has been and continues to breath on her own, and on numerous other factors and questions with regard to her long term prognosis. Simply stated, the removal of Mrs. Schaivo's feeding tubes is not and cannot be condoned." Every wanted to see Mt. 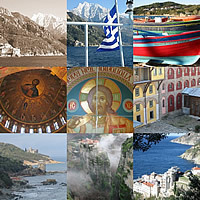 Athos in Greece? My friend Patrick Barnes got to go, and set up a nice web page of photos. He also recently visit St. Anthony's Monastery in Arizona, which is a little piece of Mt. Athos here in America. Click here to see those photos. Warning: The bottom of this boot could be the last thing you will ever see. 1) "Warning: starving this woman to death by removing her feeding tube, in the event that she should need one, may result in you needing one yourself, after her father beats you senseless." 2) "Warning: In the event that this woman's husband should seek to use his rights as a husband to kill, injure, or otherwise harm her, the father of this woman may seek to resolve the situation by making her a widow." 3) "Warning: If you starve this woman to death, you should earnestly pray that her father has first attained theosis (i.e. sanctity)." 4) "Warning: My daddy considers your esophagus to be a feeding tube, and if you remove mine, he may remove yours." 5) "Warning: Removing a feeding tube from this woman could result in your ending up on Al Jazeera, tearfully pleading to have the feeding tube reinserted." sons-in-law that I might have would be at least uncertain enough that they would not have to test the question scientifically. "Sisoes, great among the ascetics, stood before the tomb of Alexander, Emperor of the Greeks, who at one time had shone with glory; and horrified by the inexorable passing of time and the vanity of this transient world, "Lo!" he cried aloud, "beholding thee, O Grave, I fear the Judgment of God and I weep, for the common destiny of all mankind come to mind!... O Death, who can escape thee?" XII. 8. The practice of the removal of human organs suitable for transplantation and the development of intensive care therapy has posed the problem of the verification of the moment of death. Earlier the criterion for it was the irreversible stop of breathing and blood circulation. Thanks to the improvement of intensive care technologies, however, these vital functions can be artificially supported for a long time. Death is thus turned into dying dependent on the doctor's decision, which places a qualitatively new responsibility on contemporary medicine. Holy Scriptures treats death as the separation of the soul from the body (Ps. 146:4; Lk. 12:20). Thus it is possible to speak about a continuing life as long as an organism functions as a whole. The prolongation of life by artificial means, in which in fact only some organs continue to function, cannot be viewed as obligatory and in any case desirable task of medicine. Attempts to delay death will sometimes prolong a patient's agony, thus depriving him of the right to «honourable and peaceful» death, for which the Orthodox Christian solicit the Lord during the liturgy. When intensive care becomes impossible, its place should be taken by palliative aid (anaesthetisation, nursing and social and psychological support) and pastoral care. All this is aimed to ensure the true humane end of life couched in by mercy and love. 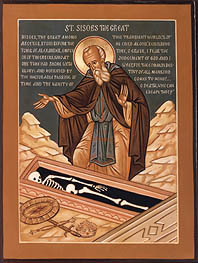 The Orthodox understanding of an honourable death includes preparation for the mortal end, which is considered to be a spiritually significant stage in the life of a person. A patient surrounded with Christian care can experience in the last days of his life on earth a grace-giving change brought about by a new reflection on his journey and penitent anticipation of eternity. For the relatives of a dying man and for medical workers, an opportunity to nurse him becomes an opportunity to serve the Lord Himself. For according to the Saviour's word, «inasmuch as ye have done it unto one of the least of these my brethren, ye have done it to me» (Mt. 25:40). The attempt to conceal from a patient the information about the gravity of his condition under the pretext of preserving his spiritual comfort often deprives a dying person of an opportunity to be consciously prepared for death and to find spiritual consolation in participation in the Sacraments of the Church. It also darkens his relations with relatives and doctors with distrust. Death throes cannot be always effectively alleviated with anaesthetics. Aware of this, the Church in these cases turns to God with the prayer: «Give Thy servant dispensation from this unendurable suffering and its bitter infirmities and give him consolation, O Soul of the righteous» (Service Book. Prayer for the Long Suffering). The Lord alone is the Master of life and death (1 Sam. 2:6). «In his hand is the soul of every living thing, and the breath of all mankind» (Job 12:10). Therefore, the Church, while remaining faithful to God's commandment «thou shalt not kill» (Ex. 20:13), cannot recognise as morally acceptable the widely-spread attempt to legalise the so-called euthanasia, that is, the purposeful destruction of hopelessly ill patients (also by their own will). The request of a patient to speed up his death is sometimes conditioned by depression preventing him from assessing his condition correctly. Legalised euthanasia would lead to the devaluation of the dignity and the corruption of the professional duty of the doctor called to preserve rather than end life. «The right to death» can easily become a threat to the life of patients whose treatment is hampered by lack of funds. Therefore, euthanasia is a form of homicide or suicide, depending on whether a patient participates in it or not. If he does, euthanasia comes under the canons whereby both the purposeful suicide and assistance in it are viewed as a grave sin. A perpetrator of calculated suicide, who «did it out of human resentment or other incident of faintheartedness» shall not be granted Christian burial or liturgical commemoration (Timothy of Alexandria, Canon 14). If a suicide is committed «out of mind», that is, in a fit of a mental disease, the church prayer for the perpetrator is allowed after the case is investigated by the ruling bishop. At the same time, it should be remembered that more often than not the blame for a suicide lies also with the people around the perpetrator who proved incapable of effective compassion and mercy. Together with St. Paul the Church calls us: «Bear one another's burdens, and so fulfil the law of Christ» (Gal. 6:2). "British physicist Stephen Hawking has become a Fugitive from Mercy, having escaped through a wormhole as doctors surrounded his Cambridge home. 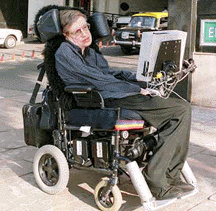 Physicians were summoned Monday evening when his wife remembered that a few years ago, Hawking had asked to be shoved down a flight of stairs if the battery on his electric wheelchair ever ran out. Of course, he denies it in that goofy robot voice of his...but Teresa Heinz-Kerry will tell you that computers can be hacked. Hawking has suffered from a degenerative muscular disease for 40 agonizing years, and he's never seen a single episode of Queer Eye. It's time to let him go. He led a long, productive life, but now he deserves to Die with Dignity, whether he likes it or not." Let me get this straight: it would be cruel and unusual punishment to put Lee Boyd Malvo to death by lethal injection because he was under 18 when he went on a killing spree, and shot more than a dozen people in cold blood. But it is humane to slowly starve Terri Schiavo to death. But who are we to question the god-like judges we have these days, who feel free to write their own laws, and disregard the will of the people? If judges are going to usurp these powers, perhaps it is time we consider making judicial appointments subject to up or down votes ever 4 years, to coincide with the presidental election. If they are going to put themselves over the executive and legislative branches of government, the least that should happen is that the people should have the right to send them packing if they do something stupid like letting murderers live while killing crippled and defenseless women. The Feast of the 40 martyrs of Sebaste is one of the more important feast observed during lent. They represent in a striking way the struggle of Christians during the fast. But I first heard about the 40 Martyrs long before I became Orthodox... while watching John Jacobs and the Power Team on TBN (you know, the guys who break the bricks and the baseball bats, and blow up hot water bottles until the blow up). For the traditional (and more historically accurate) version of their martyrdom, you can click here. Click here for another similar version that provides original source references. But although the John Jacob version placed the story during the wrong persecution, and gives the wrong name for the 40th martyr... it preached pretty well, and from poking arround on the web, I've seen enough similar versions quoted in Protestant texts that I suspect it comes from some late western version of their martyrdom. For some reason, this version refers to them as "wrestlers", though they were soldiers. But it follows the same basic outline as the older versions. They are told to renounce Christ. They are made to stand all night in a freezing lake, while bond fires and warm baths are set up on the beach to entice them to apostatize. Of course, John Jacobs put a bit of umph into the telling that this text does not fully convey... but this gives you some idea. So I have to thank John Jacobs and the Power Team for introducing me to these wonderful saints. If Terri Schiavo were a dog, starving her to death would land you in Jail. Michelle Malkin points to several examples of people going to jail for animal cruelty for starving animals. Why isn't someone locking up that judge in Florida? Something has to be done about these judges who think that they are God. Note: My comments are those of a private citizen, and do not represent the Texas Health and Human Services Commission in any way. I know it's Lent, and I should be focusing on more edifying and pious matters, but today there are several news items that cry out for comment. The company in Colorado that designed their ill-fated computer program (CBMS) will ring a bell for those in HHSC in Texas -- it's EDS (Electronic Data Systems), which was the original contractor for the first phases of the TIERS system here in Texas (and has it's hands in other aspects of HHSC). Well now the Governor of Colorado wants a consulting firm to conduct an "independent review" of what went wrong with CBMS, and so whom does he choose? Deloitte & Touche... the same company that has the current TIERS contract in Texas. Deloitte ought to know a lot about computer systems that cost hundreds of millions and don't work worth a hoot in hell, because they designed the one we have in Texas. The only thing that has thus far prevented Texas from experiencing the same disaster as Colorado is the fact that the State of Texas has kept TIERS in a pilot phase for years beyond the date that the whole system was supposed to have been rolled out to the whole state. It is very curious how three corporations keep turning up with their fingers in the government pie: EDS, Deloitte, and Accenture. As they used to say in the Ginsu commercials.... "But wait, there's more!" So, citizens of Colorado… if you are lucky, you might eventually have a system that works as well as the old system… though it will take 25% more staff than it did before. And ye Citizens of Texas take note, because currently the people in charge of HHSC in Texas are under the impression that a similarly flawed system is going to be so efficient that they will be able to cut 57% of our staff and still produce at the same level as we currently do. But wait! It gets even better yet. “The commission (HHSC) announced on Feb. 25 that it had tentatively selected Accenture for the job. The Bermuda-based company has clients around the world and an office in Austin. …A week after the announcement, IBM filed its protest with the agency. Harris said state officials could not release specifics of the protest because IBM had stamped it proprietary and confidential. The agency likely will request an opinion from the attorney general's office, she said. "I think with the complexity and the size of a contract this large, and the significant overhaul that is being done with the eligibility system, it's not surprising that there are protests being made through our normal protest process," Harris said. The same day they received IBM's protest, state officials received the letter by Dukes and Turner. Dukes said she received her information anonymously. "It is our understanding that Accenture bragged to another vendor that they obtained copies of (IBM's) proprietary technical architecture for the . . . proposal, and that Accenture's Tim Overend shared the architecture with a vendor, commenting that others were retaining the information on their computers," the letter reads. Overend declined to comment when reached at his office Wednesday. •Hazel Baylor, a contractor for Accenture, was the commission's deputy commissioner for planning, evaluation and project management in 2004 and had specific knowledge about the request for proposals. •Gary Gumbert, the commission's chief information officer, was hired within the past year from Maximus, which has partnered with Accenture on the project proposal. •Anne Sapp, a commission employee who had attended confidential vendor presentations as part of the agency's proposal evaluation team, is Baylor's housemate. Anne Sapp is not just a commission employee, she was the Executive Deputy Commissioner of TDHS (prior to the consolidation) and in charge of the TIERS project, and you can see this (as well as Hazel Baylor’s old position) here. At this link, you can see when he was with HHSC, dealing with Deloitte from the other side of the table. And now we see that he is on the Deloitte side of the table. It is also interesting that Gregg Phillips and was involved in Mississippi's Health and Human Services in the early 1990's, where Phillips spear-headed a disasterous downsizing that ultimately had to be cleaned up after he left. He then went to work for another private company that contracts with government Social Services agencies, before being hired by HHSC in Texas. How is it possible that people can jump so freely from HHSC into jobs with the companies they dealt with while on the State’s payroll? 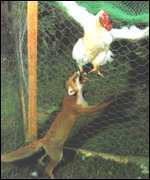 What a tangeld web of conflicting interests. The people who are depending on the services these agencies provide are the last on the list of priorities here. Second to last are the State Employees who are getting the shaft in this process. A reporter’s career is waiting to be made by getting to the bottom of these billion dollar boondoggles (and I do mean “billion”… as they say, a few hundred million here and a few hundred million there, and pretty soon you’re talking about real money). O Lord and Master of my life, a spirit of idleness, despondency, ambition, and idle talking give me not. But rather a spirit of chastity, humble-mindedness, patience, and love bestow upon me Thy servant. Dear in the Lord brothers and sisters, while traveling through the salvific days of the holy Great Lent, let us rejoice together with the Holy Church on the arrival of the "God-granted time of repentance," and may we not be saddened by the arrival of Great Lent, but saddened by our own sins, for the time has come to heal them. As the Holy Church sings: "The fast is here, the mother of chastity, the accuser of sins, the advocate of repentance, life of angels and salvation of men." Lent is established by God—this is a divine gift, a period of prayer and abstinence, a time to protect oneself from all that is sinful and secondary, seeking only the One we need. Lent is not only the abstinence from non-lenten food, but mainly a time to reveal our fundamental sinful sores and removing them. The Church teaches us: "Let us not keep the fast by merely abstaining from foods, but [let us put away from us] every material passion" One can only see ones material passions with a clean mind, and fasting and prayer are the best means to cleanse the mind. Lent is also removing oneself from entertainment. Life in this "electronic age" is full of all sorts of amusements which debilitate our consciousness; this has firmly established itself in many Orthodox homes, they are forms of entertainment that litter our souls with images of passion, which deprive the faithful of "the divine time of repentance." During these cleansing Lenten days, dear brothers and sisters, let us leave behind our screens and monitors which blind our spiritual sight, let us close the doors of our senses to all that is useless, let us abandon enmity, quarrels, divisions, all that is extraneous, corrupt and harmful to the soul, and then Lent for us will truly become Great, and will bring us great benefit. In this way, passing through the salvific Forty-day Lent, we will be able with a clean conscience and with the clear sight of faith to greet the Crucified and Resurrected Christ, and will able to worthily kiss His Divine wounds and prostrate ourselves before His glorious Resurrection from the dead! General George S. Patton III grew up in California, but in a family that came from Virginia and was quite Confederate. His Grandfather, George S. Patton I was a Confederate War Hero, and a student of Stonewall Jackson at VMI. "As a child who got on his knees (another lifelong habit) to recite his nightly prayers for his mother, Patton thought two small portraits on the nearby wall were of Jesus and God [the Father]. 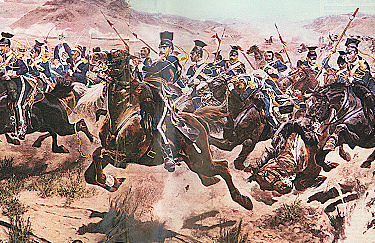 Only later did he learn that the two bearded men were Stonewall Jackson and the man who was revered as the "God" of the Confederacy, Robert E. Lee" (Patton: A Genius fo War, by Carlo D'Este p. 39f). While General Patton initially held these men in a bit too high of esteem, this gives you some idea of the reverence with which Southerners preserved their memories. Stonewall Jackson is of course remembered as one of the greatest generals America has ever produced, but most people would be suprised to learn that this Confederate General considered one of his highest callings to be a Sunday School teacher for a class of free and slave black children. What most people now would also be unaware of is that Sunday School was the only school many poor children had in those days, and it was here that they not only learned the Bible, but also how to read and write. It was against the law in Virginia at that time for a white man to teach blacks how to read, and though Jackson was one who normally was a stickler for rules, obedience, and respect for those in authority, he regularly violated this law to make his children literate and fervent Christians. Many black Churches in the area were started by Stonewall Jackson's students, and he is still remembered kindly in these communities. In fact, when the Union occupied Lexington, Virginia (the site of Stonewall Jackson's grave) "the Confederate flag which floated over Jackson's grave was hauled down and concealed by some of the citizens. A lady who stole into the cemetery one morning while the Federal army was occupying the town, bearing fresh flowers with which to decorate the hero's grave, was surprised to find a miniature Confederate flag planted on the grave with a verse of a familiar hymn pinned to it. Upon inquiry she found that a colored boy, who had belonged to Jackson's Sunday school, had procured the flag, gotten some one to copy a stanza of a favorite hymn which Jackson had taught him, and had gone in the night to plant the flag on the grave of his loved teacher." (from the same article). See: Stonewall Jackson, Champion of Black Literacy, for more. Uncle Tom was no "Uncle Tom"
Note also: If you are wondering why a priest is talking so much about the welfare system, see this post. Next week, Orthodox Lent begins, and so I will be blogging a lot less on this topic come monday next. There is an old saying that if your only tool is a hammer, every problem starts to look like a nail. This is certainly true with the privatizing government work to make government more efficient. It has almost become a fad, and one almost wonders if we will one day replace the military with mercenaries that work for a company traded on the Dow Jones Industrial. I will readily agree that privatizing aspects of government business often makes sense. For example, if an agency has its own print shop, but there is a private printer who can do the same printing for less, it makes sense to privatize your printing. And that printer can do it for less because this is his business, and he knows how to do it efficiently, and he’s in it for his own profit which motivates him to find ways to be efficient. He can be innovative, and can readily change how he does business to find new ways to beat the competition. However, when it comes to some aspects of government work, this simply does not work. One can find printers in the yellow pages, but one cannot find a for-profit company whose business it is to give people money, food, or medical care for free. There simply is no free market element to giving people stuff… for nothing -- which is what welfare is. If the proposal was to contract with private charities, you might have something to work with, because the Salvation Army, for example, does have experience in giving people stuff for nothing, and doing it efficiently and effectively. But if you are going to leave the same rules in place that govern welfare programs today, there is no reason to believe that any entity is better suited to administer them than the people who are currently doing it. This is particularly true in Texas, were the Texas Department of Human services had one of the lowest error rates of any state in the country, and for 5 or 6 years straight received enhanced funding from the federal government as a reward for that level of accuracy (something no other large state had ever done). And the overhead cost in Texas are among the lowest in the country… it’s workers being among the lowest paid in the country. A private company cannot be innovative when it comes to policy and procedures that are mandated by the State and Federal government. It would have to jump through the very same hoops. And what most people who have never actually worked with these programs often do not realize is that the policies are so complicated that it takes about 6 months before one can even begin to work these cases accurately, without someone constantly looking over their shoulder and checking their work. It takes about a year to begin to really work independently. And about another year before one has really been around the block, and knows how to handle just about any case that they might encounter. Private companies can only economize on staff – and given the low level of pay that already exists, there is not much room to economize. Paying their staff less, and providing them with even less job security and medical benefits will mean that they will have a higher turn over rate. Our agency already has a problem with high turn over simply due to the low pay and the high stress, which getting back to the time it takes to properly train someone to do the job right, means that at a certain point you are being penny smart, and pound stupid when you “economize” on their pay and benefits. The part of our agency's work which has already been privatized (the Choices Program, which is the part of the agency that helps people find work) has a huge problem with turn over, and consequently has a high percentage of staff that do not know the policies pertinent to their work. In my job, I interact with these private contractors a great deal, and about a year ago had a problem with one of their workers who made an error, and when I spoke to that person’s supervisor I was told by the supervisor that she was new, and didn’t know the policy either. (Holy blind leading the blind, Batman!) I would also say that they have a much greater tendency to cut corners with policy, to do things that help them meet their numbers but cause their clientele to suffer needless (and often unfair) interruptions in benefits, and generally operate in ways that shift work back onto the state workers in HHSC than did their state employed predecessors prior to privatization. In short, these private contractors owe an allegiance to making a profit, first and foremost – and while there is nothing wrong with a business making a profit, that is not why we have a welfare system. The number one goal needs to be to help the people we are asked by the government to help, and to give them the benefits that the government has determined that they should have based on their needs. If there is any other bottom line at work, then the eyes are on the wrong prize. Why don’t we replace the military with mercenaries? Because we want soldiers who fight for the love of their country and aren’t in it just for the money – and who are answerable only to the government, which is answerable to the people. The reason why we should not have a for-profit corporation running welfare is because we should have people who want to help the needy of our country rather than people who want to make a profit off of the needy. We should want people who answer to our elected representatives, rather than to their stock holders. What I would say to those lawmakers that are advocating privatization as a means of saving money is this: If you don’t like these programs, eliminate them. If they are too cumbersome, and you want less bureaucracy, then stop complicating them with the laws you pass, and simplify them. But if you want to keep these complicated programs in place, at the same benefit levels as we have today, then please properly fund the administration of these programs. When you cut staff, or have staff that don’t know what they are doing because you can’t find competent people who will work for the pay you are offering, or keep them when you do, this only results in greater fraud and abuse. It takes time, and knowledgeable staff to work a case accurately. It takes a lot less time and skill to simply give people what they want, and get them out of your office. We have to decide what we want, and then pony up the money needed to accomplish what we have decided to do. And to read about Accenture (the Bermuda based company that stands to gain from the privatization of much of the Texas Health and Human Service Commission's work), see this page. This past Sunday was the Sunday of the Last Judgment. This is the last week prior to the start of Orthodox Lent, this coming Monday. "When the Son of man shall come in his glory, and all the holy angels with him, then shall he sit upon the throne of his glory: And before him shall be gathered all nations: and he shall separate them one from another, as a shepherd divideth his sheep from the goats: And he shall set the sheep on his right hand, but the goats on the left. Then shall they also answer him, saying, Lord, when saw we thee an hungred, or athirst, or a stranger, or naked, or sick, or in prison, and did not minister unto thee? Then shall he answer them, saying, Verily I say unto you, Inasmuch as ye did it not to one of the least of these, ye did it not to me. For more on the meaning of this Gospel, the significance of this Sunday in the Church year, and the icon of the last judgment, click here. "Foolishness is bound in the heart of a child; but the rod of correction shall drive it far from him" (Proverbs 22:15). "Withhold not correction from the child: for if thou beatest him with the rod, he shall not die. Thou shalt beat him with the rod, and shalt deliver his soul from hell" (Proverbs 23:13-14). "The rod and reproof give wisdom: but a child left to himself bringeth his mother to shame" (Proverbs 29:15). WILLIAMSBURG, Va. -- Police arrested an 8-year-old boy who allegedly had a violent outburst in school, head-butting his teacher and kicking an assistant principal, when he was told he couldn't go outside to play with other students. The 4-foot pupil was led away from Rawls Byrd Elementary School in handcuffs Tuesday and charged with disorderly conduct and assault and battery. "It's not something that happens every day," Maj. Stan Stout said of what could be the department's youngest arrest ever. Stout said the chair-tossing, desk-turning outburst occurred after a teacher, and later the assistant principal, attempted to stop the boy from joining his classmates. The child was later released to his parents. It wasn't all that long ago when this kid would simply have been given a whupin, and that would have been the end of it. But now most schools do not spank kids, and so the only alternative is this. The question to ask is which is crueler to a child: to give him a spanking, or to discipline him through the criminal justice system? The first line of defense against anti-social behavior should not be a policeman slapping on the handcuffs. This icon was on of the few recently painted icons we had on display. It is inscribed in English and Arabic. Most of the icons were painted in Russia between the 17th and 19th centuries. I've just posted on our parish web page a photo report of the Icon Exhibit we hosted on February 12th, 2005. It was quite an exhibit for our little parish to pull off, and I must say it went exceptionally well. 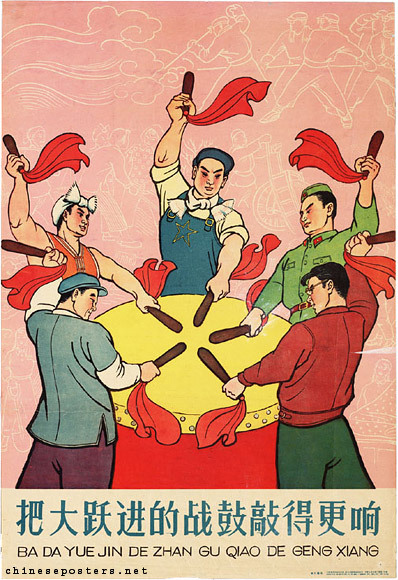 "Strike the Drum of the Great Leap Forward Ever Louder"
Having worked in bureaucracy for about 13 years now, as I have watched decisions come down from the top that were based on unrealistic expectations, divorced from the realities on the ground, I have often thought back on a documentary I once saw about Communist China’s Great Leap Forward. 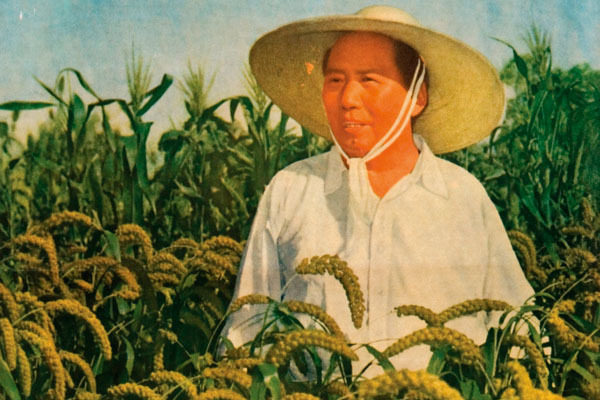 To make a long story short, Mao wanted to make China’s economy as powerful and as productive as the American economy, so he simply decreed that it would be so. 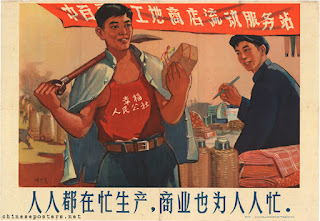 He realized that to produce more manufactured goods, he need more factory workers manufacturing goods, and to get those workers we would need to take them from working on the farms. But he knew he would still need to feed those workers, so first off he decreed that food production would be doubled. The order came down the chain of command, and all the lower level bureaucrats were told that they had better make it so. Of course the means to achieve this goal were not provided, and in fact, the means were being reduced because labor was being redirected away from agriculture into manufacturing. "The People's Communes are good"
This documentary showed a rally were a series of Commune leaders pledged how much more they would produce than they had the previous year. One would come forward and say “Commune number such and such will produce twice as many bushels of rice as last year.” Then the leader of another Commune would come forward, and pledge to do four times as much. All of this was greeted with loud applause, however, not much thought was given to how this was going to be done. When the harvest came, all the bureaucrats sent up reports that made it appear as if they had in fact met their goals… but they hadn’t. But operating under the assumption that they had produced all this food, they could now concentrate more on building up their industrial/manufacturing capacity. 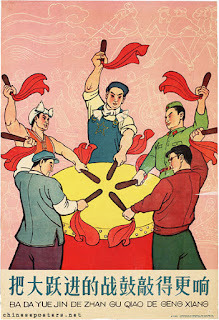 So it was decreed that each city and village would produce x amount of manufactured goods, and so local officials around China made sure that it was so. All over china, little iron smelting furnaces appeared. To meet production quotas, quality iron goods were often melted down and made into worthless low quality metal that broke into pieces when it was used. "Everybody is fully occupied in production, the Trade Sector is also fully occupied for everybody"
While all this was going on, the reality of food production started to catch up with those who had bought into the lies, and soon there was starvation all over China. Likewise, in my time with what used to be known as the Texas Department of Human Services (now part of the Texas Health and Human Services Commission), I have seen on a smaller scale similar acts of bureaucratic insanity. For example, several years ago the idea was pushed that if we stopped doing one on one interviews with out clientele, and started doing group interviews of 30 to 50 cases at one time, we would save all sorts of time, and have more time to devote to other aspects of our business. There were problems of course. All of our offices were laid out with one on one interviews in mind, but since another region had done this successfully, and claimed that it saved them time, it was decreed that we too would follow this model. Supervisors, who were sold on the idea, believed that they could schedule twice the number of people in a week. And in fact, many people were interviewed very quickly, but after about a month I began to notice an increase of calls from people who were complaining because their case had not been processed. This continued to increase, and it became apparent that we were interviewing people faster than we were able to complete the cases. In fact, fewer cases were being processed than before, and gradually we were getting behind. Fortunately, the office that I worked at at the time had a manager who had sense enough to go back to the old system as soon as this became apparent, even though the orders were still that we should be doing it the new way. Our office went up to the edge of the cliff, and slowly back off. However, there was another office nearby that did not have such a manager. By the time something was done about it, the office literally had to be closed. Several months of cases were now backlogged, and it fell on other offices to clean up the mess that was left over the next several months. Sometime after all of this, I remember hearing that a time study was done, and it was determined that even when done by people who were comfortable with doing group interviews, the amount of time that they actually saved was statistically insignificant. It just seemed like they were saving time because they rushed a bunch of people in and out of their offices at one time, and had more quiet time to do the follow up work on those cases. Unfortunately, the new approach to doing our work that is being pushed through in Texas is likewise based on unproven premises that are not connected with reality. They believe that they will be able to do the same work with 57% less staff, thanks to the use of call centers and a new computer program that still isn’t working properly and takes longer to actually use than the old program. There is every indication that they are charging ahead with this plan, despite what we see unfolding in Colorado. In the aforementioned minor implosion, there were reserves that did not implode that were able to pick up the pieces. In the proposed model, if it implodes, there will be no unaffected parts of the agency. "Nearly 1,000 calls for urgent state welfare or Medicaid benefits following problems with the state's new computer system remain unresolved according to a report issued by the state Monday. The computer system, the subject of a lawsuit filed in Denver court, has been blamed for causing a backlog of nearly 30,000 people waiting to find out if they can receive benefits.... The $200 million Colorado Benefits Management System went online Sept. 1 even though county workers had complained of glitches. The Colorado Center on Law Policy sued the state after the system was blamed for delaying payments to thousands of residents receiving benefits and keeping cases from being processed." Debbie Allmer, who lives in La Salle and has custody of her two young grandchildren, said she doesn't want excuses. She applied for food stamps in August and qualified, but it took until mid-December before she received any benefit. When Allmer asked for back food stamps to cover the previous months, she was told she'd receive $12 for each month. Then, a month later, she got a letter in the mail saying her benefit would drop to $2. "I don't care if your computer is screwed up," she said. "We'd kind of like to eat." Finally, the social services department solved the problem and now Allmer receives $170 a month in food stamps. Allmer isn't alone. The system is using up reams of paper to notify people who receive benefits. Often, recipients get the same notice multiple times, or the notices are incorrect...."
"...While the number of county residents in need grows, a new system meant to ease the workload for human-services employees and streamline the benefits process instead has hindered the system. Six months ago the state brought online a new computer system to improve the benefits system aiding employees who assist clients. However, La Plata County's human services employees have been overwhelmed, Pat Carlson, La Plata County's director of human services, said during the county commissioners' meeting on Monday. "We have one case worker handling most of the cases," Carlson said. "It is clear we don't have enough staff." Temporary employees were hired to help with the conversion to the new Colorado Benefits Management System that was initiated in September, Carlson said.... Before the Colorado Benefits Management System was initiated, processing a new food stamps case took 20 minutes. Now it takes more than an hour to complete. Carlson is considering asking the county commissioners to allow her to hire additional employees. "We feel like we are fighting an uphill battle," Carlson said...."
See also Off the Kuff's comments on this.